Friday I discovered a beautiful thing. I have heard rumors about its greatness, and have listened to stories about this wonderful machine, but I for one had never experienced the power myself. Until this weekend. I used a Red Box for the first time this weekend. That thing is amazing. Sorry Blockbuster, you just lost another customer. I rented THREE movies this weekend for less then what I would have paid for ONE movie. 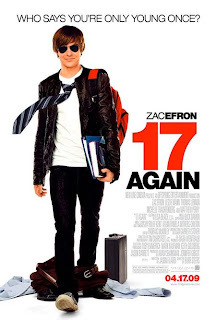 Friday we watched 17 Again. And let me just say, I totally get the Teenage Infatuation with Zac Efron. He is a cutie. I LOVED this movie, it might be one of my new personal favs! We also watched 7 pounds which I won't even discuss. Totally sad and depressing and left me with a movie-hangover. Not my kind of movie. Saturday I woke up to coffee and chocolate chip waffles prepared by my husband. He is seriously the most amazing husband. I'm not the mushy type so I usually don't give him the credit he deserves, but he is definitely a great one. Better than any teeny-bopper zac efron. I always thought coffee was disgusting until last week. But, I think my taste buds changed because now I think it is some great stuff. And my coffee-lovin' husband is excited! He has always wanted me to drink coffee with him and now I actually want to drink it, instead of gagging while he gulps it down by the gallons. Later that day after Luke dragged me away from the TV, we went and purchased some end tables that match our coffee table. I have been wanting these tables for the past year and we finally decided to get them this weekend. It was a good thing we did because they have now been discontinued and they only had one left in the store in our town- but the store in my parent's town had the other one so they went and picked it up for us. I have to think it was perfect timing because we got an amazing deal on them due to the fact that they were discontinued. Yay! Then we went to Hobby Lobby to get picture frames for the new tables. I got a little distracted and lost my reason for being at Hobby Lobby for a brief moment, because they had their ENTIRE stock of Christmas supplies out. It was crazy! I think it is way to early, but no matter what time of the year it is, I go a little crazy when it comes to Christmas decorations. Luke had to literally pull me out by my arms. Does anybody buy Christmas decorations this early?? Do you feel like its too early? I totally do. Does anybody use Red box. It's my new love. Until American Idol starts again and then my love will be Ry Ry. Hhaaha, Christmas trees in August? What happened to the back to school stuff? Welcome to the dark side with the Red Box. Whoever invented it was pure genius! Redbox is the best invention!! Dustin and I use it all the time! We LOVE Redbox and haven't been to Blockbuster in probably over a year...can't beat $1 rentals!! And yeh, I was in a store yesterday with the decorations out and the Christmas music playing. Crazy. Having a giveaway today...TARGET. Go check it out. Oh my goodness- we're totally in love with Red Box. It's all we use now! And you don't even want to know what I spent on Christmas decor a couple weeks ago...I couldn't help myself! LOVE redbox!! We use it all the time. It is way too early for Christmas decorations to be out in stores. I am so diggin' the Red Box. How fun!! Now I think I want to go rent me a movie!!! WAY TOO EARLY TO BUY CHRISTMAS DECORATIONS. the.end. Chocolate chip waffles for breakfast? He is definitely a keeper! I use Netflix, so I never go to Red Box. But I did just add 17 Again to my list on Netflix last night! Glad to hear a good review! It is NEVER too early to be thinking about Christmas decorations. I enjoyed '17 Again' too. In fact, that was when I finally saw that Zac Efron actually can act (as opposed to when he started on 'Summerland' and was awful). 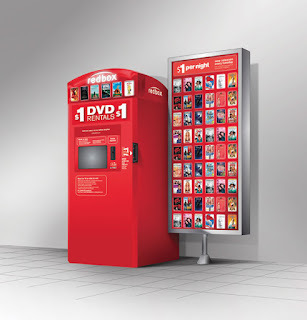 I love Red Box...there is one just a couple of minutes from our house and we use it whenever we want to rent a movie. Blockbuster who? You are too cute...I swear, you don't take a bad picture! I was randomly in the grocery store once and saw redbox--and now would never back!! That thing is the best invention, and so cheap. I totally love Redbox too!!! It is possibly the greatest invention! Christmas decor at Hobby Lobby?!? Why does this not surprise me?? oh my gosh! the Christmas stuff is out?? YAYAYAYAYAYAYAY! Yeah, so I'm a little excited... I.LOVE.CHRISTMAS. NEver used Red Box but I would REALLY like to try it out now! I am a coffee junkie! It is yum and good for you!! we use Red Box all the time. My husband even signed us up for free codes- they will send you a text on the first Monday of every month with a free movie rental for that night. As if Red Box could get any cheaper. and I can't believe they already have Christmas stuff out! They start earlier and earlier every year!! I love Redbox! Once in a while you might get one that's scratched or messed up but to me, it's totally worth all the money you save. I laughed when you said Luke had to pull you out by your arms b/c that's exactly how it is when JD and I go to Hobby Lobby! First of all...I LOVE CHRISTMAS (per my blog about it the other day) no matter what time of year! So just imagine to yourself the giant smile I got looking at your pic with the trees AND flip flops!!! Second of all...I have been drinking coffee since I was 8 y.o. Hayden calls it the "drink of death" and what I would give if he would convert the way you have. It's fun to just sit and sip on coffee with someone you love. :) Yay for you and Luke!!! i love christmas, but i'm a little stressed out that it's happening so soon!!! i need to get to halloween first! so glad y'all had a great weekend! wish we had hobby lobby in MN! I have always wanted to try the Redbox thing, I just never think of it! HA! I love Hob lob and they have got some seriously cute Christmas things this year! I've used Red Box a couple times and it is great as long as you turn the movies in on time! But working at a bank I have had a lot of customers come in with fraud on their accounts from Red Boxes as well..so I would be cautious...not to make you scared! but just so you know! You look so cute there in Hobby Lobby! I can't wait to put up the Christmas tree already! And yes, Christmas stuff out now is just too early! They started putting it out in our HL's before Kyah was born in June! Okay - you are more and more a girl after my own heart. Words cannot describe how much I love Christmas decorations. This might make me sound like a freak, but I believe I was a senior in high school when I started purchasing my own. By my jr year of college, our apartment was a Christmas explosion. I literally have tubs of Christmas decor. But I LOVE IT. It is truely the most wonderful time of the year for me. It's never too early or too late, especially if it's on sale. I always buy things after Christmas and then when I pull the decorations out the next year I'm all like oh wow! I forgot about this! We just ordered Christmas music at church for the choir so my boss has been sampling the music and I keep saying "I love Christmas music". Okay. wow. this is like 5 pages long. Oh, I saw the red box like this weekend and I thought, i really need to try that. Christmas trees already!!! Oh my goodness! That does make me kind of excited though :) And you look adorable in your dress! Maybe your hubby can talk to my hubby about the coffee and chocolate chip waffles?? So sweet!! yes it's totally too early for christmas decorations! and We love redbox too at our house! So convenient and cheap! Oh yes...the Red Box is AMAZING!! And so convenient, rent a movie after you get your groceries! Love it! I'm wanting to see 17 Again! And I love Christmas and all that goes with it so that is very very exciting to me!! Although it is still a wee bit early! Let's at least get through Halloween! Girl, we love Redbox!! So glad you discovered and love it! And, my word that Christmas trees are already out. Way.too.early! Awesome Blog. Love, love, LOVE the wedding pics! Redbox is the best invention ever! All hail the mighty Red! How are trees even out this early? I have a neighbor who gets her decorations shipped in from Aussie, she hasn't called me over to browse catalogs yet. A sign that it's way wayy too early. Not sure if anyone else already said this but if you sign up at redbox.com you can get a text message the first Monday of the month with a code to use for a free one! We love redbox and even have 17 again waiting in one right now for us! Please tell me what made you try coffee. My husband hates it as well but I LOVE it. We were at the mall today and saw the Christmas store is already fully stocked. We just laughed and kept going. we just starting using red box recently too! we've been completely striking out w movies though=)! Christmas decs already?? =) I can't think that far ahead yet! We must not have Red Box in the South. I've never seen one or heard about it except on blogs.. Cool concept though. So this weekend while trying to convince my hubs that we needed to see 17 again, I totally used your tweet about how your hubs didn't think it was "so bad, as far as chick flicks go"! I told him that a friend's husband that totally wasn't into chick flicks actually sorta liked it! Thanks for letting me use ya'll!! It got the movie on my net flix queue! That was so very sweet of Luke. And now I really want some chocolate chip waffles! i could maybe understand the christmas decor if it wasn't 104 degrees outside. I'm SOOO ready for fall! i couldn't believe all of the christmas decor at hobby lobby either! i was there a couple of weeks ago, and they were already putting ornaments out. the trees weren't up yet. waaaay too early for me ... but i'm like you, i love christmas decorations!